Today's post is written by Willa Ahlschwede and sponsored by Tucan Travel. When I decided to buy a motorcycle in Peru, I thought it best to not tell my parents. I didn’t know how to ride it, and I was planning on taking it from Cusco, perched high in the Andes, all the way to the town of Puerto Maldonado nestled in the humid, vast jungle below. It seemed pointless to cause them inevitable worry, even though my plan wasn’t quite as reckless as it seemed. My route would be the newly finished Carretera Transoceanica Sur, the transcontinental South American highway connecting the oceans via Brazil and Peru. My boyfriend and I spent a few months working up our skills and nerves on the bike until finally we hit the trail. Though the new highway was smooth and paved, the journey was anything but easy. Leaving Cusco, we rode past ruins in Raqchi and stopped to see the painted church of Andahuylillas. The road curved through the valley, all green hills and fields in flower, and the bike hummed along toward the looming peaks. We hung a left after Urcos and passed the new banner for the Transoceanica Sur, with its pictures of jaguars and toucans promising to deliver us to the selva, jungle, safe and sound. The air thinned as we climbed over the first pass, engine putt-putting on the steep grade. Finally on the other side, the snowcapped peak of Ausungate welcomed us and reminded us we weren't out of the hills yet. We slept, exhausted and saddle-sore, as the biggest pass towering at 4,750 meters awaited us. The next morning we rose early, put on every layer we had and started the ascent. In the brilliant sun, dogs chased us and llamas scattered as we chugged past. After an age of crawling slowly up the steep incline, we suddenly hit the top, then immediately coasted back down again, almost crashing into a herd of sheep in our excitement. As we descended the air became more humid, and the cold began to drain from my frozen fingers. We wound further down the mountain. On the bike in the open air, I noticed more of our surroundings. We stopped in places that tourists never stop and everyone wanted to chat with us unusual outsiders. By lunchtime in the gold-mining town of Quince Mil the air was hot and sticky and the river wide and languid. The road straightened out in the lowlands and we sped on toward bustling Puerto Maldonado, arriving after ten long hours. The young guys that ran our hostel thought we were more than a bit crazy. They explained that the very next day the road was going to be closed indefinitely by a strike. As the feeling started to return to my backside, we laughed and looked forward to slow days drinking fruit juice and waiting for the road to open. Thankfully, we were in no hurry. 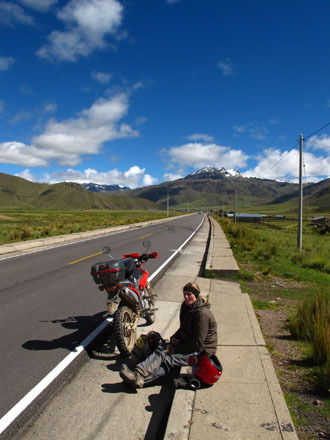 If you want to go on your own motorcycle adventure in Peru, several companies in Cusco can help you live your dream. Cusco Moto Tours, Eric Adventures and Peru Explorers are all agencies which offer motorcycle rentals for experienced riders and high-quality guided and custom tours along various routes. Some also allow you to pick-up and drop-off your bike in different cities. If you’re looking for a Peru adventure of your own, contact a specialist in tours in South America.